What do you think is meant by the phrase extreme poverty? ​What economic factors could explain the changes in the graph below? Absolute poverty exists when a person’s continued daily existence is threatened because they have insufficient resources to meet their basic needs. Absolute poverty – in 2008, the World Bank set the poverty line at $1.25 a day at 2005 GDP measured at purchasing power parity. Some economists measure the poverty line at $2 a day. According to the most recent estimates, in 2012, 12.7 percent of the world’s population lived at or below $1.90 a day. That’s down from 37 percent in 1990 and 44 percent in 1981. This means that, in 2012, 896 million people lived on less than $1.90 a day, compared with 1.95 billion in 1990, and 1.99 billion in 1981. Progress has been slower at higher poverty lines. Over 2.1 billion people in the developing world lived on less than US $ 3.10 a day in 2012, compared with 2.9 billion in 1990- so even though the share of the population living under that threshold nearly halved, from 66 percent in 1990 to 35 percent in 2012, far too many people are living with far too little. ​How does deprivation vary by leading cause of death? Relative poverty exists when a person is poor compared with others in their society. Most poverty in developed countries tends to be relative poverty. Relative poverty – this is measured in comparison with other people in the country and will vary between countries. People are considered to be in relative poverty if they are living below a certain income threshold in a particular country. For example, in the EU, people falling below 60% of median income are said to be ‘at-risk-of poverty’ and are said to be relatively poor. 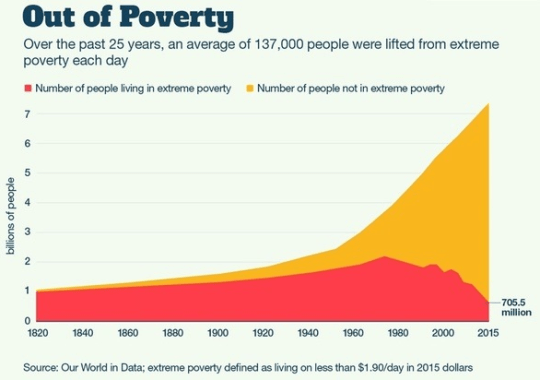 Causes of changes in absolute poverty and relative poverty include: changes in the rate of economic growth, economic development, FDI, policies which result in increased trade, government tax and benefits policies, and changes in asset prices. China alone accounted for most of the decline in extreme poverty over the past three decades. Between 1981 and 2011, 753 million people moved above the $1.90-a-day threshold. During the same time, the developing world as a whole saw a reduction in poverty of 1.1 billion. > The success of the UK Government in reducing absolute and relative poverty within the UK. S&C - Do the same activity but with a country of your own choice.